Doctors and self-professed health experts have touted the benefits of a Mediterranean diet. People living in Greece or Italy are suspected of living with more fresh fruits and vegetables, along with an abundance of extra virgin olive oil. This, along with siestas and lots of good red wine seem to contribute to their longevity — and admirable lifestyles. More than fifty years ago my Italian family lived this fabulous diet without even knowing how smart they were. The genius behind the food eaten at my mother’s table was her father, my grandfather Pietro Uddo. He came to America as a young man in his twenties from Pianno de Grecco in Sicily with his 16-year-old wife, Francesca Elisabeta. Starting in the tenements of the Lower East Side, they brought eleven children into the world (only nine survived.) They worked their way up from tenement-dweller to home owner. 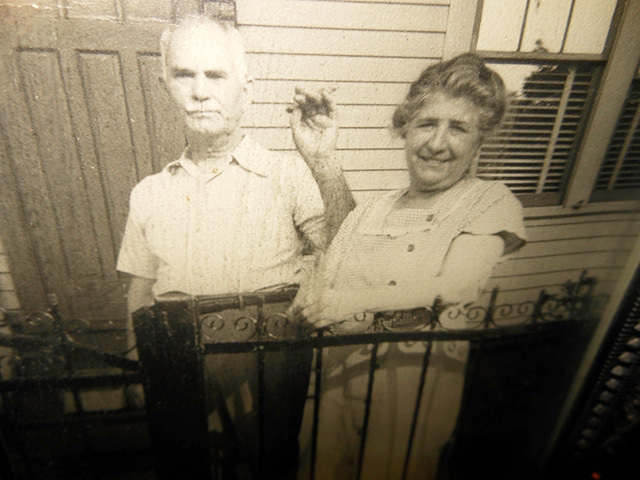 The high point of my grandfather`s life was when he bought his house on a corner lot in Brooklyn. It was here he planted his fig tree; it was here we shared many meals on that long table. It was in that house in Brooklyn, that the food my family ate would be the subject of a culinary feast. Each morning, my grandfather started his day with a raw egg that he sucked out after pricking a small hole on one end. He would wash that down with his homemade wine in a large glass filled with fruit, like apples or peaches. My grandfather`s vines covered the backyard, connected to many plants. They tasted bitter to me when I would pick them, but he would bring them to the basement and crush them with his feet in a large tub. Bottles would line the shelves as he would refill them year after year. My grandparents had a sumptuous feast at Christmas and other occasions, but the everyday meals were simple. Pasta was often the center — pasta with peas, pasta with red kidney beans, pasta with white beans, pasta with broccoli, pasta with broccoli rabe and, if nothing else was available, pasta with grated cheese and butter. There were tons of vegetables at these basic dinners, too. Cauliflower was boiled and then breaded and baked with olive oil. Asparagus spears were breaded and baked in the oven to perfect crispness. We scavenged for good food, too. It was either spring or fall when my grandfather would wander the streets of Brooklyn, looking for empty lots with overgrown weeds. I found out later these weren’t weeds — hey were called “gardunia”. He would also pick the dandelion flowers when they were new and cook those as well. Meals everyday were healthy with lots of other vegetables that were grown in the small garden. Every spring, however, was the high point of strange foods. My grandmother would prepare a “lamb`s head” (capazella) in the oven. She would put breadcrumbs and seasonings all over it and serve it to my grandfather on a platter. This caused all of the grandchildren to scatter out of the room. But curiosity would often get the better of me and I would sneak back to just peek at this meal that seemed to satisfy my grandfather so much. Once, I can recall his poking out the eyes and devouring them. I remember running from the room when he went to eat the brain. And if one of the grandchildren got a cut, my grandfather would take a leave from the grape vine or fig tree and cover the injury and wrap it up in a handkerchief. While we often felt foolish wearing leaf on our legs for a day or so, I have to say the healing was miraculous, with no scab. My grandfather never saw a doctor in all of his 82 years. He never took any medicine, not even an aspirin. His medicine was his diet. In the middle of a night in May, 1959 he woke up with what he thought was indigestion. He was looking for one of his home remedies, perhaps a mint leaf from the garden when a massive attack felled him and he died. My grandmother lived to be 82 as well. They never talked about dieting, or took anything extreme. They cooked what they liked, with an eye on what was right for their bodies. So maybe there was something to their diet after all. tagged in family, olive oil!